This beautiful gallery grave is 9m (29.5ft) long and 1.5m (5ft) wide. The chamber is covered by four great capstones, supported by two granite slabs on the E and W sides and seven and six stones respectively on the southern and northern sides. 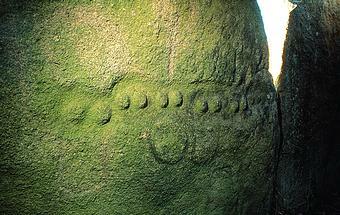 It is accessible from a NW gap, an artificial entrance where one of the sidestones is missing. The chamber is particularly interesting for the presence of eight pairs of breasts in low relief, carved in an approximately horizontal line, with a collar or necklace below each pair (the two sidestones that bear respectively two and six pairs of breasts are the second and third on the left from the entrance). These carvings were probably connected to the cult of the goddess-mother, protector of the dead and the harvest. On the site two collared flasks and some sherds and flints were found during excavation in 1939.